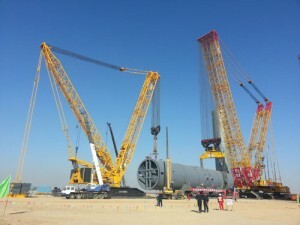 Recently, XCMG’s two giant crawler cranes of 4,000-tonnage and 1,000-tonnage cooperated under the vast blue sky of Ningxia, and extended booms like two cranes wing to fly. They slowly hoisted a tank of 1,900 tons, precisely delivered it to the specified position, and perfectly finished hoisting task again. At Ningxia Coal Industry Group’s chemical product production base in Ningdong Town, Yinchuan City, the main crane of XGC88000 used operating condition of boom of 84 meters and multiplying factor of 88, while the XGC16000 crawler crane for tail flip-slip used operating condition of boom of 42 meters and multiplying factor of 48. The two ‘brothers’ of XCMG closely cooperated and worked flexibly, and successfully hoisted the tank to the specified position within only about 2 hours, which reflected the immense power of XCMG’s products as treasures of the country. Which script are you talking about? Please get back to me.